Adventures in Africa: Could teaching be my calling? I am absolutely ecstatic right now… My first day teaching was an absolutely incredible experience! The case was a really great mix of qualitative discussion and quantitative analysis, and the students were enthusiastic about participating. The two hours flew by, and when we went over the key learnings from the class in the last ten minutes, I was deeply touched at how much the students had taken away from our discussion! It really made me appreciate the case-based method that we engage in at Ivey - although we don't always enjoy reading such long cases each night, and we rarely acknowledge the value of the information we're being presented with in each case, there is a considerable amount of learning that happens through each analysis. We really have developed so much as decision makers over the last two years, without even consciously realizing it! I also tip my hat to all case-based learning Professors out there… It is not easy asking a question, carefully rephrasing it, and still getting 90 blank stares! Thankfully, this only happened at the beginning of class for me, simply because many people had not read the case in detail. Once we got into the meat of the discussion however, everyone was able to contribute their own ideas and present alternate points of view, as all were able to relate to the business featured in the case: a Ghanaian water purification plant and packaging company. Overall, it was a fabulous first day teaching, and I am so thankful to be here. Although we're here to teach, I am confident that I am learning so much more from this experience! Looking forward to the teaching days ahead! We arrived home after class to meet our assistant for our stay. This guy is simply amazing. He washed all of our concrete floors, hand washed a week's worth of laundry, and strung ropes all over our porch in a sort of web to dry everything. 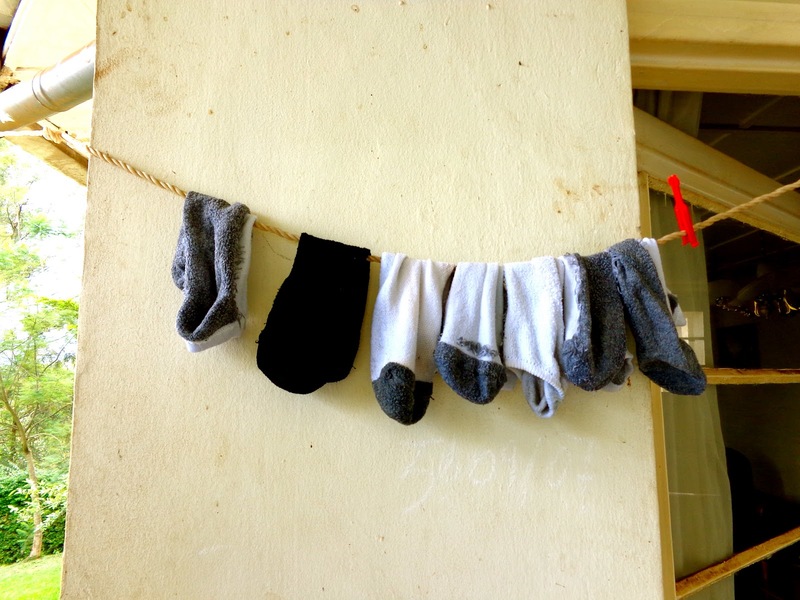 I'll refrain from sharing that particular picture and show you some socks along the wall instead, but I can tell you it's quite a sight to see all of our colourful undergarments clipped to these ropes outside, something we don't often see at home! You're doing awesome Salima! Keep posting in this blog! Thanks so much for reading Scott - will definitely keep documenting our adventures!